In last week’s “Chaos," every story reached a boiling point. One of the key stories this season has been that of Sammy (Shawn Hatosy) and Ben (Ben McKenzie), whose partnership and friendship will be at risk if and when Sammy finds out that Ben is more involved than he realizes in his quest to find the guys who tore up his house and jeopardized the life of his small son. Hatosy teased tonight’s finale in an exclusive Q&A, along with his personal wishes that this is not be the end of Southland. And while TNT has yet to pick up the show for a sixth season, this current run has definitely proven the show is not going stale in any way, shape or form. TV Fanatic: Going into the finale, I’m guessing things are going to go to a boiling point between Sammy and Ben. Is that safe to say? Shawn Hatosy: I think so. All season long we’ve been heading in a direction, and the fans will be thankful to hear that there will be some resolutions and they will definitely get answers this week coming up. So they have to tune in. TVF: Sammy is going to feel such betrayal when he finds out that Ben has orchestrated so much that has gone on in the last couple of episodes. SH: If he finds out. I mean he was a great detective, but even though all the clues are pointing to his partner, he seems to be going a pretty roundabout way of figuring this the f**k out. TVF: It’s true. It’s right under his nose. SH: The writers have done a very interesting job of creating these two characters and they are both great characters on their own, but once you put them together in a car, it just magnifies it, it makes it explosive. Ben is this cop who as a rookie was wide eyed. He joined the force. He thought he could do some good and clearly the job and things from his past have shaped him and turned him into this almost sociopathic police officer, and yet he still continues to climb and be rewarded. He is an award winning cop. Meanwhile, Sammy is a cop but is going in the opposite direction. He is going in reverse. So ultimately, while Sammy makes mistakes, I think when he is pushed to these decisions and the fans are pretty much split on who’s right and who’s wrong here, but I think at closer look, you’ll see that Sammy ultimately makes the right choices. So it’s an interesting dynamic and coming up on the finale there’s definitely a satisfying ending to the season for their journey. TVF: I thought it was a nice moment in 509 when a woman basically is flirting with Sammy and he doesn’t even realize it until just at the very end, which made me kind of laugh because Sammy is so wrapped up in his world. Is there any glimmer of that potential romance in this episode? SH: There’s a glimmer, for sure. He’s coming out the other side. It’s funny, you get to see as an actor what people think of your character pretty quickly online, in real time. So you can see that people think that Sammy is just spinning out of control and he is spiraling, but I don’t see it that way. I think he’s truly focused and he knows what he wants and I think this is the healthiest we’ve seen him. I mean since Nate (Kevin Alejandro) died, anyways. But yes, I think that he’s definitely going to put himself back on the market again for some date nights. TVF: Sammy needs to get laid, that’s the bottom line! SH: Exactly! That’s funny too, because it’s what he probably needs more than anything, and meanwhile Ben has got so many girlfriends that he doesn’t know what to do. And he is cheating on them, he’s lying to them, he hits girls. Remember last season he hit some girl and they all love him, and meanwhile poor Sammy is just going backwards. He’s back on patrol from being a detective and he can’t even figure out that he’s being flirted with. TVF: I know the finale is a lot about finding the guys who kidnapped Cooper and Lucero. Does Sammy have a piece in that? SH: He’s wrapped up in his own story, and he inadvertently becomes involved. TVF: We don’t know yet if Southland is going to get a sixth season but is everything wrapped up in the finale, or is there maybe a little seed of something that could be the next step for Sammy and/or Ben? SH: Well, either way I think it works. Ultimately if it were to end, it would be sad regardless because it’s such a great show and the characters are alive. And when I say that I mean they’re living breathing characters that have so many dimensions and it’s just rare in television. So, it would be sad if it ended, and I don’t want to see that happen to these guys because I don’t think we’re really done. I think there are some shows that get worse and we’re just starting to get to the point where we’re kind of at our best. We’re climaxing. We’re at our peak here and it would be nice to continue them. I love the show so much and the fans have been instrumental in keeping it alive. I guess we’d like to say thank you. It would be awesome and would mean a lot if people would tune in and watch it live, at least for the finale. 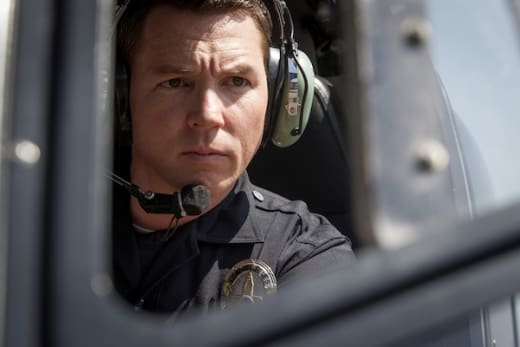 Southland airs its season finale tonight at 10 p.m. on TNT.